In my pizza-eating travels around Chicago, I have had many slices of Chicago thin crust, stuffed, deep dish, and even New York-style pizza. I haven't eaten much Neapolitan pizza, so I figured I would eat at one of the best-ranked Neapolitan pizzas in town, Sapore di Naploli. Sapore di Napoli is a regular on Time Out Chicago and Chicago magazine's top-ranked pizza places. It is also a BYOB restaurant in Lakeview, which probably helps its popularity. But Chicago pizza eaters should keep in mind that Neapolitan pizza is different than most pizza we are accustomed to. 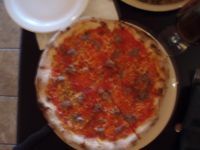 Authentic Neapolitan pizza should be made of the San Marzano tomato and milk from the water buffalo. The pizza tends to be thin, has a chewy dough, and is known for its fragrant ingredients. I'm not sure how authentic Sapore di Napoli's Neapolitan pizzas are, but they definitely fulfill the fragrant requirement. The ingredients are incredibly fresh; the Salsiccia pizza's Italian sausage was homemade and tasted incredible, and the mushrooms from the Funghi pizza were more complementary to the pizza than any pizza I can remember eating. The Margherita pizza was ranked best in town by Chicago magazine, so you might choose to evaluate the restaurant by its known dish. I was pleased by my Neapolitan pizza-eating experience, and the restaurant is clean, comfortable, and a good place to have dinner and a bottle of wine on a warm summer's night. The pizzas are personal and are in the $12-$15 range. There is street parking available that is metered. The ambiance and experience move me to want to visit Sapore di Napoli again, but I feel fine with waiting until next summer to do it. Visit Sapore di Napoli on 1406 Belmont and check out its site for more details.